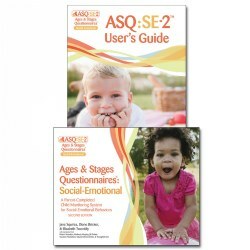 Now enhanced and updated based on extensive user feedback and a NEW unparalleled research sample of more than 12,000 children, ASQ-3™ is the most accurate, cost-effective, and parent-friendly way to identify children from one month to 5 1/2 years with developmental delays. 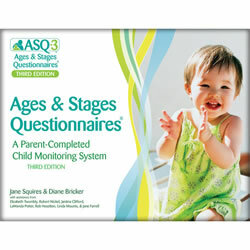 This kit gives users quick, convenient access to all the items they need during the ASQ screening. 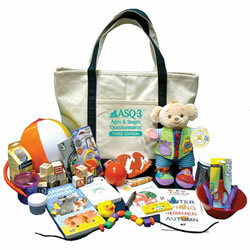 The ASQ-3™ Materials Kit has approximately 20 engaging toys, books, and other items designed to encourage a child's participation and support effective, accurate administration of the questionnaires. All of the materials in the kit are safe, durable, easy to clean, age appropriate, culturally sensitive, and gender neutral. 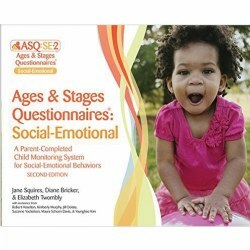 This convenient Starter Kit includes everything you need to start screening children with ASQ:SE-2™ : a box of 9 photocopiable paper masters of the questionnaires and scoring sheets, a CD-ROM with printable PDF questionnaires, the ASQ:SE-2™ User's Guide, and a free ASQ:SE-2™ Quick Start Guide. Choose English or Spanish. 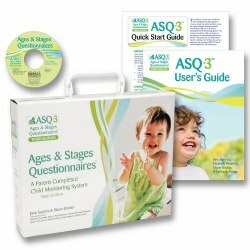 Everything you need to start screening children with ASQ-3™: 21 photocopiable print masters of the questionnaires and scoring sheets, a CD-ROM with printable PDF questionnaires, the ASQ-3™ User's Guide, and a FREE ASQ-3™ Quick Start Guide.